You may or may have not heard of the wonderful book, The Five Love Languages by Gary Chapman. It is one book that literally saved our marriage. We were married at the young age of 21 and had our first child at 22. We were babies ourselves and had no idea how to live with another person. We didn’t even understand the basics of relationships really. The Five Love Languages, was introduced to us 5 years into our marriage. It was almost too late for this book to have even worked. We were on the brink of divorce. I had gone back to college to attend medical school. The divorce rate for med students, then, was over 90%. I knew, with our already growing challenges of life, that med school would probably be the end of our family. It’s funny how God knows the right time, if you are willing to be open, to help you. To give you a nudge in the right direction. This book was a big nudge. I am so thankful. In our first 5 years of marriage, we were fighting constantly, and it was about the “little” things. Like… I always clean the house, why don’t you love me enough to help out. Or he was wondering… why I didn’t give him hugs and kisses like before, didn’t I love him anymore? We thought because the other wasn’t fulfilling each of our needs we didn’t love each other and that this marriage thing wasn’t going to work out. We just didn’t understand that my needs were not the same as his, and vice versa. We have been married for over 20 years now. No, it hasn’t been a fairytale marriage, but I wouldn’t change anything. We are more in love, have more respect, care more for each other than during those fun, wild dating years. I love our marriage. I love the life God has blessed us with. The information here, is just to give you a basic understanding of how important this book is. How important this relationship information is. The Five Love Languages is the book we give to newlyweds as a gift in hopes that they will use it and they will be blessed just as 1000’s of others have been. I encourage you to get your hands on this book any way you can. Bookstore, online, Half Price books, a friend, your church, anywhere. If you read it years ago, it may be time for a refresher. I tend to read it every 2-5 years. Most people fall primarily into one main Love Language with a second one not far behind. For example, my primary Love Language is Quality Time, then Acts of Service. My husband’s is Physical Touch and Receiving Gifts. You can see, that our Love Languages are not the same, at all. We were missing the boat on each other’s needs in the beginning of our marriage. So much that it caused daily arguments. When you learn both of your Love Languages, you can begin to see where you are missing out on each other’s needs. Filling each other’s needs is a primary relationship rule that needs to happen to help you have a happy and good marriage. So what are these Love Languages? Here is a basic description of each one. You should be able to see yourself fairly quickly. It will be one of those aha moments! Sometimes the Love Languages isn’t always about what you receive, but how you like to show love. Words are very important to you. Good and uplifting words make you happy and feel complete. Insults, yelling and put downs, can be very traumatic to you and make you depressed. You rely on uplifting words and encouragement to get you from one day to the next. Sometimes, nothing being said at all, can be the same as negative comments said to you. Not much else beats out spending time with someone else. It can be as simple as a friend visiting and sitting around just talking for hours. Or going to the local coffee shop and chit-chatting with your bff for 30 minutes. Taking a walk in the park with your hubby is a big treat. Just the two of you and nothing but nature to distract you. Movies are fine, but sometimes it’s not real quality time due to no talking. Other times, movies are great, because you are just together in each other’s presence. You love attending get togethers for the social time. If you have a friend that is in need, you will be the first one over to listen and just be there with them. “Just be with me,” is your slogan. A holiday that includes gifts don’t come fast enough! The excitement and pleasure of receiving and giving gifts are very important to you. It’s not about being greedy or wanting everything. It just makes you feel loved and lets you know that someone was thinking about you enough to pick out a gift for you. You spend hours even days picking out the right gift for someone. A lot of thought goes into finding the perfect gift. You will give gifts to your loved ones, even if it’s not their birthday or a holiday. It’s for, “just because.” The gifts that you give others, isn’t always bought, sometime they are made, or found. But they are precious little sentiments to pass on to your favorite people. You may even go in debt over this Love Language! You clean, even though you don’t like to. You run the bake sale, even if you don’t want to. You volunteer at church, even if you don’t have time. Your way of showing love is doing things for others. Serving others, sometime at the cost of your sanity. But you love it, you want others to know how much you care. The bigger the job, the more love you are showing. But, when others don’t do things for you, you are offended and sad. If your husband isn’t helping out around the house, you may think he doesn’t love you very much. If you have a party and need help, you may begin to wonder who your friends really are, since they are no where to be found when you need them. The title of this one says it all! You are huggy, touchy, feely and very lovey! When you talk to others, you need to be very near them. Maybe even in their “personal” space. You place your hand on their arm to pull them in. When you walk by a friend or coworker, you may pat them on their shoulder. Or reach in for a big hug. You never notice when others are uncomfortable with touchiness, because you are too busy showing your love and can’t understand how someone doesn’t like to be touched. When you were first dating, as most do, there is usually a lot of hugging and touching. Sometimes it’s from the newness of a relationship, but other times its because of your Love Language. If the hugging and touching stopped after marriage, then you are no doubt feeling very unloved. It can be quite devastating to you. And you may wonder what is wrong with you. Of course, nothing, but not everyone is touch and feely. Hopefully, you related with one or two of the Love Languages. And you may even notice your husband’s Love Language too. With this knowledge you need to readjust your relationship thinking. In The Five Love Languages, Gary Chapman talks about our Love Tanks. We each have one and when they are running low, we surely don’t feel loved. When they are full, we can do anything and our relationships are usually running fairly smoothly. 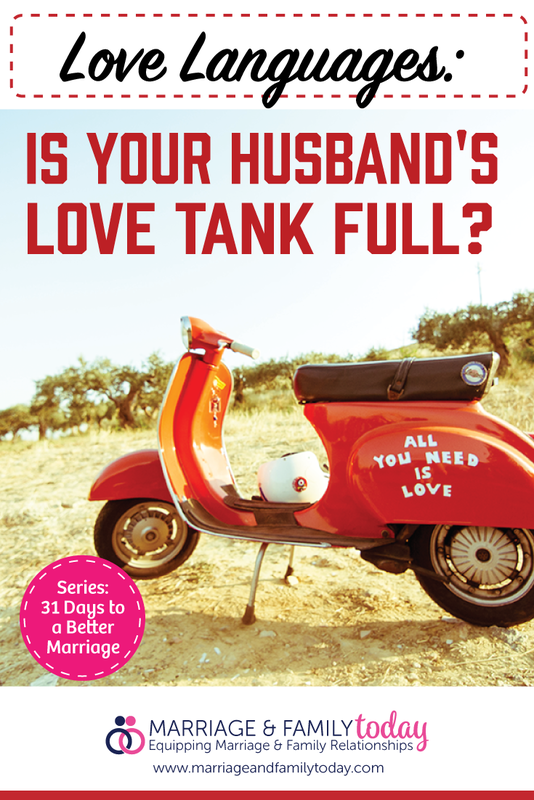 Your husband needs his Love Tank full, and of course so do you. But we’re going to focus as wives, how we can fill our husband’s Love Tanks. If you’ve recognized your husband’s Love Language, do you notice if you have been fulfilling his needs? If he is Physical Touch, when was the last time you gave him a hug and kiss as he came home from work? When was the last time you put away your digital devices at bedtime and cuddled with him? If your husband is Acts of Service, when was the last time you cooked him a dinner, his favorite? Have you recently helped him with a household chore? Or did one for him, even if it was a “guy” task, like yard work? If your husband’s Love Language is Receiving Gifts, have you bought him anything lately, besides food-food?! Next time you are at the store, grab his favorite candy or dessert. Or pick him up his favorite magazine. If your husband thrives on Quality Time and you are a busy woman, then you will have to try to manage some of your time. If you have young children, try to keep them busy for a short time, hire a babysitter or make time once they go to bed, for your husband. Just you and him. No distractions on your part. Maybe he just wants to watch TV with you or have coffee on the back porch. However he loves to spend time with you, do your best to make it happen. If your husband’s Love Language is Words of Affirmation, have you told him lately how great he is? Don’t just make up something to say that is nice, but actually find something good about him or that he has done and compliment him. Let him know with your words how much you appreciate him, even if it’s for something small, as in, he ran by the grocery store to grab the milk you forgot. Write him little love notes from time to time. Find a special card that describes him. It’s amazing what a few words can do to someone’s self-esteem and Love Tank! When you work on keeping his Love Tank full, your’s will be filled too. Just remember when you help people get what they need and want, you will get what you need and want too.